Surely I’m not the only one who is ecstatic about the rare bits of sunshine we’ve had lately. During my walks to catch these few precious rays, I’ve been happily sniffing the heady scent of Daphne , Himalayan box (Sarcococca ) and witch hazel (Hamamelis ) that’s wafting around Portland neighborhoods right now. It’s been a funny weather year – we had record cold temperatures during December, yet the witch hazels – at least in my part of town – were in flower a couple of weeks early. 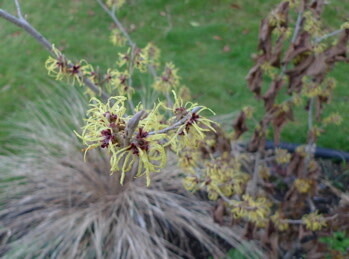 In fact, the flowers on my Arnold Promise witch hazel were unfurling in the last days of December, nearly three weeks ahead of last year. And February daphne (Daphne odora ) has begun cracking open its waxy little pink star-flowers a week earlier than last year. "The ability for plants to flower during the winter months enables them to reduce the level of competition for pollinators of their flowers… flowers pollinated in the heart of our winters face the harshest challenge, especially those that will be damaged by freezing temperatures. Whatever the price, in terms of energy, to produce flowers in the heart of winter… the benefits must outweigh the cost. So the next time you see a shrub flowering in the middle of winter, spare a thought to what went into producing that flower, and wonder at the marvel of nature." I am in full wonder and gratitude mode. Wherever I look in my garden, there’s something new busting out. I counted nearly 20 plants in bloom this afternoon – and many of them smell delicious! So in appreciation of this extraordinary climate where relatively mild winters permit us to enjoy flowers in the depths of winter, here are five treasures I wouldn’t be without. They are all readily available at local retail nurseries. And, I’d like to point out that from now through February or March really is the best time to shop for winter-flowering and winter-interest plants. If your soil is workable, you can plant them and get a preview of how they’ll look next winter – and above all, you can choose the colors and types you like best when they’re in full bloom. This is especially important with witch hazels (which can be mis-labeled) and hellebores (which are often seed-grown and vary greatly). Himalayan box (Sarcococca confusa ) Sarcococca are broadleaf evergreen shrubs with tiny, thread-like white flowers that give off a perfume that permeates the air in a most mysterious and intoxicating way. I have one by my front door and people often comment on the delicious scent wafting up onto the porch. There are many species of Sarcococca and they are nearly all intensely fragrant. They are also drought- and shade-tolerant broadleaf evergreens – so can be fit into those weird nooks where little else will grow. Sarcococca confusa and S. ruscifolia reach about 4-6 feet tall and a bit less wide; S. humilis (syn. S. hookeriana var. humilis) is about 1 foot tall and slowly suckers wider; S. saligna is about 3 feet tall with slender, fine foliage and equally fragrant but greenish strands of flowers. 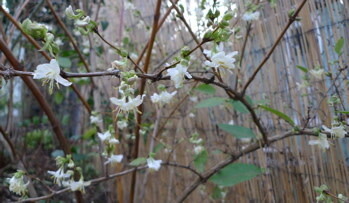 Winter honeysuckle (Lonicera x standishii Platt Garden form) – there are a handful of winter honeysuckles available including Lonicera fragrantissima (most common type). 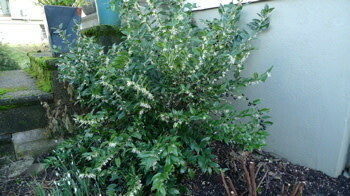 This 6×8 foot shrub has simple, bluish-green leaves which turn yellow and drop in fall, is somewhat tolerant of drought, grows in sun or shade (though it flowers most prolifically in sun) and – best of all – is completely clothed with intensely fragrant, lemony-scented white flowers in January and February. 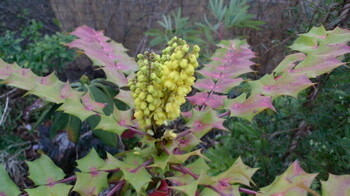 Mahonia xmedia_ ‘Arthur Menzies’ A member of the same genus as our native Oregon grape, this Mahonia was unscathed by this and last winter’s cold. It’s an evergreen with tough, spiny leaves, corky bark, and – best of all – soft yellow, fragrant, nectar-rich flowers that are wildly attractive to hummers. Arthur Menzies (and his close relatives, including ‘Charity’ and others) is fairly drought tolerant and grows well in sun or shade, although it seems happiest in dappled light or morning sun with protection from the hot afternoon light. Hamamelis xintermedia ‘Arnold Promise’ – a beautiful, small tree for a beautiful, small garden! Oddly, the dried leaves are clinging to the plant more than usual this year, in my garden and other people’s. Where’s Dr. Science when you need him? Witch hazel (Hamamelis xintermedia ‘Arnold Promise’) Witch hazels are actually small, vase-shaped trees reaching about 12-15 feet high – higher with great age. They have handsome, rumpled leaves that turn red, orange or yellow in fall before dropping. Appearing in January to March, depending on the selection, the flowers are nestled beneath showy, bright, thread-like filaments ranging in color from pale and acid yellow to burnt orange, rusty red and purplish-red. They grow well in sun or part shade. 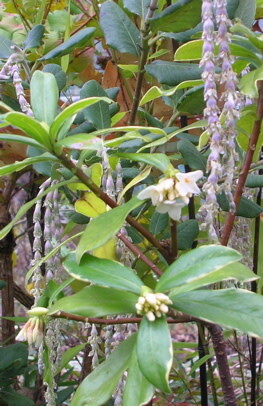 Daphne odora ‘Marginata Alba’ (the starry white flowers) with another winter-flowering plant, Garrya elliptica ‘James Roof’ behind it. This 12-18’ tall, southern Oregon and California native shrub has silky, chain-like flowers of dusky purple-gray in January and February. It’s drought-, shade- and neglect tolerant. Can’t poo-poo that. February daphne (Daphne odora) We are so lucky we can grow this plant in Western Oregon! No person who loves sweet scents should be without this winter flowering gem. Reaching about 4×4 feet, this broadleaf evergreen is most commonly seen in its creamy yellow variegated leaf form with shell pink flowers. I also grow two pure white-flowered forms: one with cream leaf variegation and one with plain green leaves. 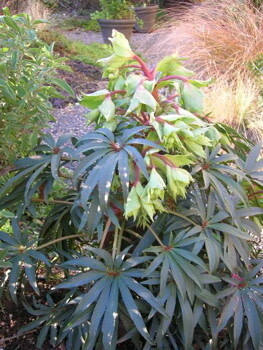 There is also a pink flowered form with plain green leaves. Plant this by your front stoop and feel happy whenever you come or go.